After an accident, a New York man with amnesia finds out the ugly truth about his real identity and past by interacting with people who seem to know him well. A pair of married ex-convicts trying to go straight get jobs at a department store. A gangster who knows about their past threatens to expose it unless they agree to help him rob the department store. After stealing a gangster's money and his girlfriend, a doctor heads for a small village in Mexico. He's all man in the ring -- or anywhere! Alex Mallick: [to Coke Mason] Let me tell you something, mister. I can still lick you if you fight like a man, but not when you fight like some kind of animal. 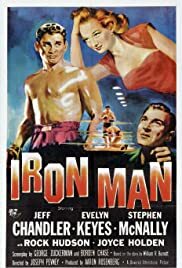 The film begins with a crowded auditorium booing the champ, Coke Mason (Jeff Chandler), as he enters the ring for a title defense. His wife who is there in the audience has a flashback and you see Coke going from coal miner (a rather obvious name for a coal miner, I know) to champion. He had no interest in boxing...mostly because when Coke loses his temper he only wants to kill his opponent...an urge Coke has kept in check all his life. But his wife and brother push and push him until ultimately he enters the ring....and is reviled by most everyone due to his being a dirty fighter. What's next? See the film. This is a mediocre film in a genre filled with excellent boxing movies. Much of what happens is pretty predictable and the character played by Rock Hudson is pretty poorly written and acted...plus Hudson was all wrong to be playing a boxer. Overall, a decent time-passer and not a lot more to it than that.